Bavette Steaks from Carman Ranch for sale. Buy online at Zingerman's Mail Order. Gourmet Gifts. Food Gifts. The bavette steak is a favorite among butchers for its huge flavor, but unknown to most of the rest of us. You might have heard the same cut called "vacio" in Argentina or "flap steak" in the US. 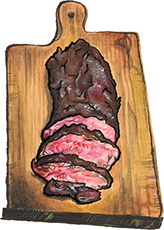 It comes from next to the flank, so it’s great for grilling up rare like a flank steak or for tossing in a stirfry. It's beefy, juicy, and slightly sweet, with a complex flavor that keeps you coming back for more. Our bavette steaks come from Carman Ranch in eastern Oregon. Carman Ranch is run by fourth-generation rancher Cory Carman. Cory's cattle spend their whole lives eating grass and chewing cud on her ranch. Though the ranch isn't certified organic, they follow organic practices and never use fertilizers or pesticides. The cattle are never given hormones or sub-therapeutic antibiotics, and they're never fed a bite of grain. Cory only harvests beef when the grasses are at their peak and the cattle are at their plumpest, which makes for incredibly flavorful beef.